It’s a familiar story: an ambitious man—or, far too infrequently, woman—seduced by the allure of success, pursues it with increasingly frantic vigor until they finally attain it, only to realize that what they’ve sacrificed in their blind hounding were the very things they wanted all along. For examples see: “Macbeth,” “Citizen Kane,” “BoJack Horseman,” just to name a few. This kind of foundational narrative is like a cut of meat and there are plenty of ways to prepare it. Some might pan-fry it cafeteria-style, serve it up raw or bury it in thick, rich, melodramatic gravy. With the Midwest premiere of Roy Williams’ “Sucker Punch,” Victory Gardens spares no expense and delivers the theatrical equivalent of a full banquet. Set in England during the reign of Margaret “Maggie” Thatcher, the play’s often painfully off-handed racism might have raised accusations of courting sympathy votes were it not for Williams’ even handed approach to morality. 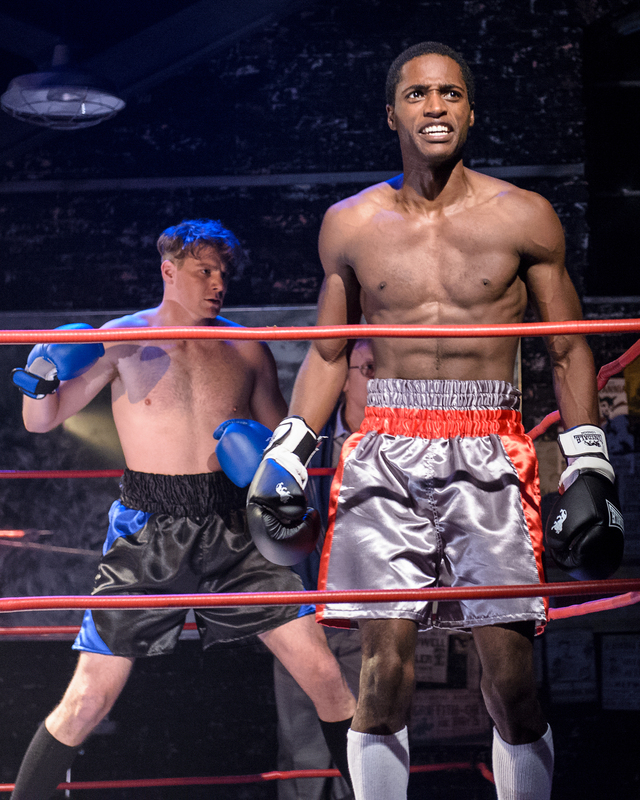 Like Spike Lee’s character in “Do The Right Thing,” Maurice Demus’ aspiring middleweight Leon is pushed and pulled in contradictory directions by seemingly everyone in his life. Particularly affecting are Leon’s tumultuous relationships with his friend-turned-opponent Troy (the silky smooth Denzel Love) and bookie father (Kenn E. Head), the latter repeatedly and casually jilting his son by betting against him. From the dizzying multitude of period-perfect costumes (Tif Bullard) to the “Raging Bull” worthy lighting (Lee Fiskness) and sound design (Christopher Kriz), “Sucker Punch” becomes a complete work of art in the hands of its equally ambitious technicians. Mark my words: if Chuck Coyl doesn’t win a Jeff Award for the fancy footwork of his fight choreography, I will eat my hat. Director Dexter Bullard ties all these elements together and pushes the play’s universal struggle into the realm of hyper-reality by blending gritty realism with Leon’s warped perception of the crumbling world around him. Victory Gardens Theater, 2433 North Lincoln, victorygardens.org, $15-$60. Through October 18.